Extinct (EX) – No known individuals remaining. Extinct in the Wild (EW) – Known only to survive in captivity, or as a naturalized population outside its historic range. Critically Endangered (CR) – Extremely high risk of extinction in the wild. Endangered (EN) – High risk of extinction in the wild. Vulnerable (VU) – High risk of endangerment in the wild. Near Threatened (NT) – Likely to become endangered in the near future. Least Concern (LC) – Lowest risk. Does not qualify for a higher risk category. Widespread and abundant taxa are included in this category. Data Deficient (DD) – Not enough data to make an assessment of its risk of extinction. Not Evaluated (NE) – Has not yet been evaluated against the criteria. North Pacific, Bering Sea east to Sea of Okhotsk and south to Aleutian Islands and southeast Alaska; over continental shelf and slope. Sea surface to 1000 meters. Adults are pelagic, migrating into rocky intertidal habitats to breed. Adult males guard the eggs that are laid in shallow/intertidal waters secured to a rock or other substrate. Large eggs produce well developed larvae that are over half a centimeter long and resemble a tadpole. The sucker disk fully functional upon hatching. Little is known about their pelagic life. Zooplankton including ctenophores, jellyfish and copepods. Bony fish, sable fish and cod, and some marine mammals including sea otters. This species is encountered at a much higher rate in the spring when they concentrate in near shore waters to breed. There is some evidence that this annual influx might be part of larger, multi-year cycle of species abundance. This is the only known species within the genus Aptocyclus. There are however many other species of lumpsuckers, family Cyclopteridae, found in the north Pacific including the Pacific spiny lumpsucker, Eumicrotremus orbis, and toad lumpsucker, E. phrynoides. 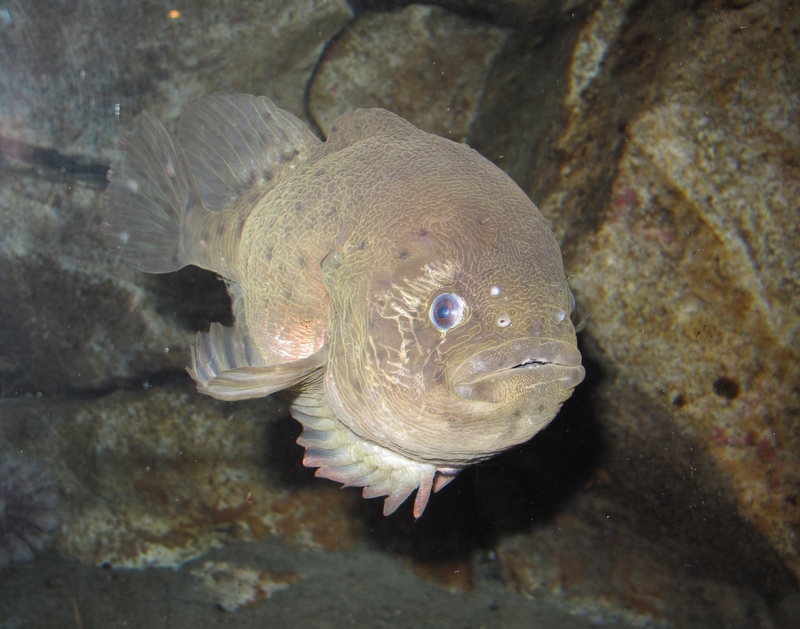 Smooth lumpsuckers are among a small percentage of fish that do not have scales.